According to the Income Tax Department notice, linking your Aadhaar with pan card is mandatory. The due date to interface PAN with Aadhaar, which was at first stretched out from 31st August 2017 to 31st December 2017 and therefore to 31st March 2018 pursued by 30th June 2018 has now been reached out to 31st March 2019. The income tax return won’t process after 31st March 2019 until PAN and Aadhaar are linked. Individuals have to link their Aadhaar with pan card by visiting the official Income Tax e-Filing website or they can do so also via SMS. How to link Aadhaar with pan card online/offline? Step2: Register yourself using pan no. How to check your pan card status that Aadhaar is linked with it or not? 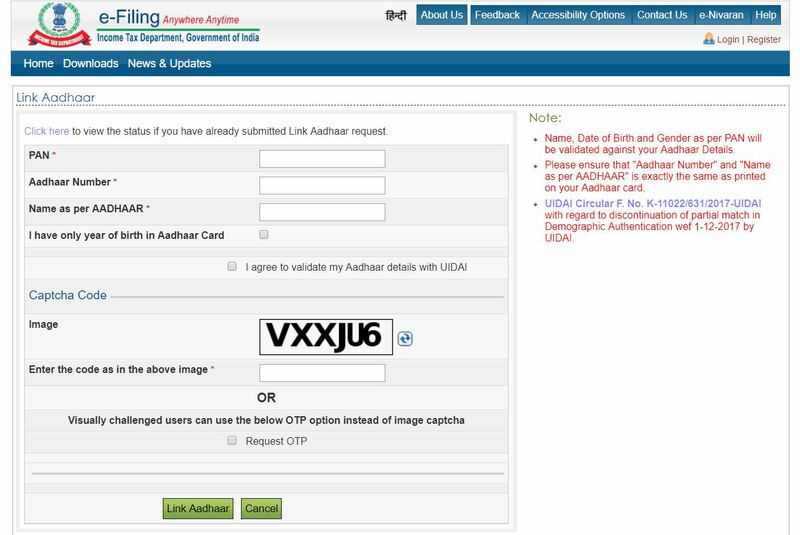 If you have already submitted the Aadhar and pan linking request, then you can check the status by clicking on this link. After that fill the PAN & Aadhaar details, and then click on View Link Aadhaar Status.